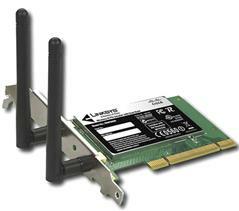 The Linksys WMP600N Wireless-N PCI Adapter can be easily used to connect computer to wireless network. Its Dual-Band capability that supports 2.4GHz and 5GHz bands can connect to Wireless-N (802.11n), Wireless-G (802.11g), Wireless-B (802.11b) and also Wireless-A (802.11a) wireless network. Installation is not difficult. Just plug in the wireless adapter to the PCI slot on desktop computer, follow up step-by-step setup wizard to install wireless adapter driver and configure the adapter to connect to wireless network. Linksys WMP600N allows you to enjoy high-speed wireless network access without running wires. By having this Linksys WMP600N, you will be able to stream video, network gaming, and Voice over IP telephony, and play multimedia application over the network easily. Its industrial-strength WPA2 encryption also helps secure your communications and information sharing on wireless network. This Linksys WMP600N is built for today’s needs and tomorrow’s digital home, let’s get it and connect to wireless network today. Let's check out additional info about this wireless adapter here. I bought this wireless card because my old wireless card that was working fine on windows xp was not compatible. I bought a new dell that had Windows 7 professional 64 bit. Surprisingly, not a lot of wireless cards would say whether they're Windows 7 compatible. I read the box on this unit and said it worked on Vista 64 bit. Once at home, i disregarded the instructions and installed the card first. Upon bootup, Windows 7 had already detected and properly installed the wireless card. It worked seamlessly. Once installed, Windows 7 Update founded a more update driver for the card. I'll post updates if i notice anything odd about this card. At this moment, I'm getting a Fair Connection with my router. The router is located at the other end of the hallway. The price is another story...yes it's very over price. I'm running Win7, 64 bit, and upon initial setup with the Linksys drivers, I had poor results regarding the signal strentgh for wireless N 5Ghz. It was indicated very low and there was no real information about the link, or other networks except that they were there. I was bummed. Simply put, the linksys drivers and software provide little information about the environment around me. I downloaded the current Ralink drivers: (PCI/mPCI/CB(RT2860 /RT2760 /RT2890 /RT2790 /RT306X /RT309X /RT35X2) - 1/18/2011 - Windows - from the ralinktech.com website and now I have lots more information about the strength of my wireless router signal as well as the strengh of other wireless signals nearby. Because I live in a city, there are about 10 other wireless N signals nearby. The good thing about the Ralink driver and application is that it shows the channel each signal is using as well as the strengh and other information. With this information I was able to change my wireless N signal to a channel that was is not being interferred by other nearby signals. For me it was channel 149 that gives the best link speed. I now have a reliable 162 Mb/s up and down link to my router. It's not 300 Mb/s, but it's the best I've achieved ever. Anyway the Linksys hardware works. It provides 5Ghz wireless N and that's what I need. Too bad they don't have better drivers and an accompanying support application for the hardware. I had to go to Ralink to get that. Setting up a home wireless network is a lot like purchasing a used vehicle. You can do all the research you want, but until you drive it off the lot and have it for awhile, you just don't know what you've got. Fortunately, this product (by and large) simplifies the process quite a bit. I purchased this product because our family recently upgraded from Wireless-G to Wireless-N. Instead of going with a potentially easier USB model, I still prefer the "traditional" PCI-slot method, as USB ports are often not as brilliant as they seem (!). It will require you to take the back of the box off your computer tower, but once that step is achieved it is quite simple to figure out just by reading the instructions and using a bit of common sense. In terms of getting the computer to accept the adapter, here's a suggestion: instead of installing the supplied software from Linksys, let your operating system automatically determine the appropriate setup, if possible. From my experience, the software has a tendency to freeze up or move very slowly, and I found it easier to just let Windows (in my case) do all the work. As for the overall adapter performance, I am very happy with it. Basically, when it works...it works! This cannot be said for all wireless network adapters. I'm situated in a downstairs bedroom that is rather distant from the wireless router, and I can still receive information nearly as fast as the computer right next to the source. Here's the only issue: When this adapter hiccups, it REALLY hiccups. After coming home from work one day after having the product work fine in the morning, I suddenly found that not only would it not connect to the network, but the computer would not even recognize that the adapter was present in the PCI slot. It took at least 30 minutes of fiddling around (taking the back off once again) to get things back up and running. Overall, this is a fine product that I would recommend to anyone looking to upgrade to a Wireless N network. The dual-band is nice to prevent telephone interference, while the product just plain does what it should: allow you to connect to the Internet from a remote location. Besides the potential for "starting over" every once in awhile (in my case, once in six months), buy this Linksys product with confidence. This device works well in Win 7 or Suse linux. I did have to do a driver update with linux but it was easily available. Now my desktop can talk to the MiFi. Mahalo. I installed this on a Dell Studio Slim 540-S. The card comes with a full-size and a low-profile bracket for the slim model. It arrived with the full size bracket attached, so I had to change to the low profile bracket, which took 1 minute and involves unscrewing and then screwing back two Phillips screws. The card fit perfectly after that. I did not use the CD and did not really read the instructions. Once I turned the computer back on, Windows 7 immediately recognized it, installed the necessary drivers and a little screen appeared asking for my wifi password. After that it worked really fast, I actually used the card to replace a cable connection. Before I was not able to always see live-stream TV but with this card I am able to do that perfectly. I am fairly close to the modem but I am separated by a wall from it. I have not tested it further away. I would highly recommend this card, I have no idea about all the negative reviews, I had never before even opened a computer and yet the whole process took me about 15 minutes and I was connected. Terrific product from a great company. Return to top of "Linksys WMP600N Wireless-N PCI Adapter with Dual-Band"! !